POS PRODUCTS NEEDS SPECIAL CORRUGATED CARDBOARD | Eclipse Print a. s.
Corrugated cardboard is basic raw material for most of POS product. It has plenty of advantages such as a low price, environment friendly material produced fully from recycled paper, easy to work out and light material. The only important disadvantage is that material is not dedicated to POS production. Far most important market for corrugated cardboard is packaging and there are no producers specialised to material that would be perfect for POS. Producers of POS products must choose from material dedicated to boxes or pay extra fee for special material, wait longer and finally, costs of so called specialities is often on the level of plastic boards. Therefore has been next investment steps of Eclipse own corrugator. It is TCY machine, fully equipped, 250cm wide, 120 m with extra fast options for replacement of material. Flexibility and other extra features will let us to produce exactly such corrugated cardboard, that is perfect for various POS constructions. 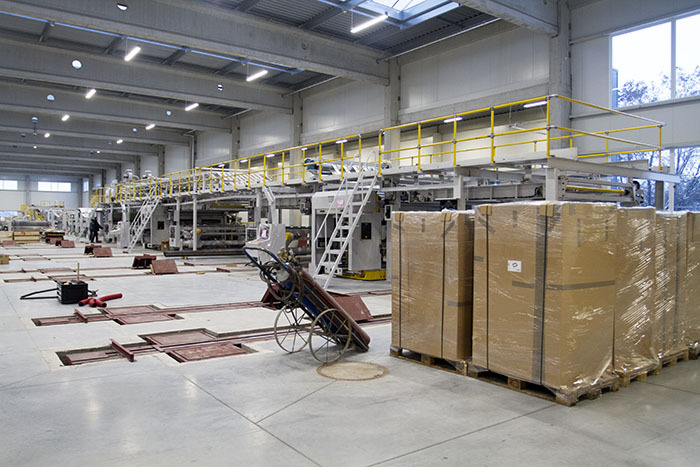 It is not only cost optimising and speed up of production, but it makes much wider range of technical solutions that can be developped without limit to choose from material produced for simple boxes. First material will be produced in January 2017 and full coverage of own needs is planned till the end of March 2017.